Who would of thought it? 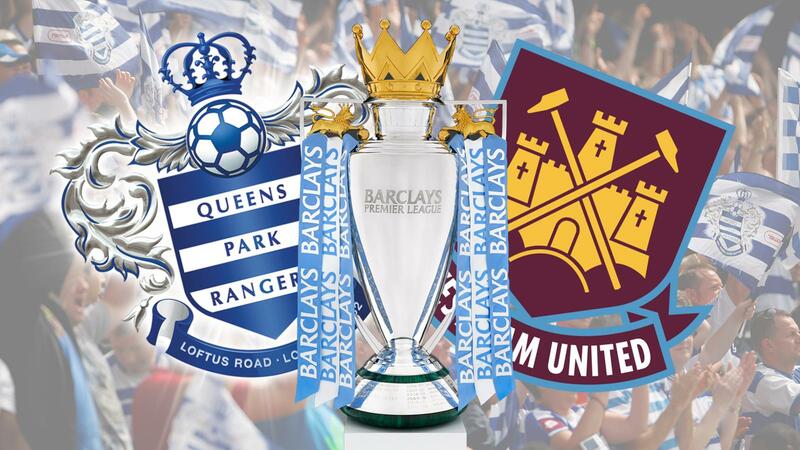 The R’s and the Hammers in the EPL ! After the humiliation against Wigan, Sam brought out the big gins for the visit to Loftus Road. Cole up top, Carroll on the bench, Diame reinstalled in the middle, and unsurprisingly no Tompkins in the back four. No point embarrassing yourself on the Telly. Ex Hammer Zamora started for the R’s unlike the shafted Rob Green. For two teams that play football, the game started quite ugly, and turned into a head tennis match. After 3 minutes RVT fot the ball on right, got through a challenge, and put a cross in for Nolan. Big Kev made a mess of the shot, straight onto Jarvis’ head, and into the net. Cheers, 0-1 to the Hammers. After that, the next 15 were end to end with no end ! WHU seemed to be quite “agricultural” in the tackle, and luckily Mark Clattenburg was light on the yellows. On 19 minutes QPR had a free kick that put some panic into the West Ham box, and ended up with Jussi sparking out Winston Reid. Having had a concussion last season, and the fact he wasn’t moving a lot, they were a little concerned, and they subbed him off for Tompkins. Winston left on his feet, which hopefully is good news. Once again CC seems to be getting penalised for no reason. Maybe Sam needs to have a chat with the refs, a la Mr Rogers at Liverpool. Noble seemed more settled, must be his new wallet balancing him out. On 33 Joey O’Brien went off with an injury for McCartney. So, with about half an hour gone, we are two defenders down. What to do, eh? How about a goalmouth scramble, an excellent cross from Tompks, and a smart finish from Ricardo Vaz Te, for his first of the season. Happy birthday RVT! With 5 to go, from a QPR free kick, Cisse gets a nice volley in only for Jussi to push over the bar. This was the first time he had really been called into action in the half. The weight he seems to have lost since he signed for WHU helped him him get up to it, I’m sure! After 5 minutes of extra time, WHU go into the break 2 up, in a game that was really even to be fair. WHU pushed a little more and were harder in the tackle. The second half started in West Ham’s favour, with Diame forcing a save from Cesar, and QPR seemingly all over the place. After 55 minutes Mark highes made a double sub and brought on Adel Taarabt, who waited 70 seconds before rifling in a screamer into the top right hand corner. 1-2 to the Irons. Then the game livened up as you would expect, and WHU started to look concerned., picking up needless yellows, and running balls out for no reason. Jussi made a brilliant save from Granero, only then to get booked for time wasting. On 67 Carlton Cole missed a stone wall sitter by putting wide, after Nolan picked up a loose pass, and put him through perfectly. Definitely a man not in form.His reward was also a yellow, along with Kevin Nolan who did no more than question the ref (this is the job of the captain, isn’t it ?). With the game going against us bit by bit (another save by Jussi, after a good long range shot by Cisse), BFS played the trump card and brought on Andy Carroll in lieu of CC for the last 20. The big question now was “Is he fit ?”. With 15 to go, Diakite (a second half sub) got his second yellow, and the R’s were down to 10. Once again the pendulum swung the way of WHU. QPR were tired and this didn’t help. Carroll made a nice knock down to RVT, whose strike pulled a fantastic tip on to the bar from Cesar. With 2 to go, Jussi made another good save from Zamora, to keep WHU ahead. The extra time went up as 6 minutes, real Fergie time stuff, and QPR seemed back in the ascendancy. Howlett forced another Jussi save from distance. James Tompkins made it 8 yellows for West Ham. Just before the end, Carroll took a ball down, turned and got a shot off, and was unlucky to get a rebound. That was about the end of the match, and WHU recorded their first away win of the season, and went 7th in the league. Not a lot to winge about tonight, but once again selection is odd. O’Brien in front of George Mac. Really ? Training must show things i’ve never seen. Noble seemed more content, with Nolan ,and Diame, moving well around him. While we are blowing smoke up ourselves, lets stay grounded. We seem to play well against teams at our level, but we will struggle against anyone who wants to pass and move quickly (as proved by Taarabt). Cisse and Bobby Z were never going to set fire to the grass tonight. I said earlier in the season 10 points before Arsenal would do us well. We have 11, and our real season starts on Saturday. We might need to watch the discipline as well, with 8 yellow cards ! What was encouraging is that we seem to be getting more shots off, because we are playing further up the pitch. Andy Carroll’s return was unexpected and welcome. The crowd must get a mention. Its so good to hear on old school London derby crowd, with both sides going for it. MOTM: Noble played well, AC looked the part when he came on, but Jussi Jaaskelainen kept WHU in the game. Much to Rob Green’s disappointment, I’m sure. Brora Oct 2012 IOS6 on a 3GS !